The General tab displays the Salesforce integration settings. The Connected account displays the Salesforce username of the integration user. Here, you can change your Salesforce integration user or connect a different Salesforce account to HubSpot, or connect a new Salesforce sandbox to HubSpot. This setting displays the number of API calls used by the integration within the past 24 hours. Under Allocated to HubSpot, you can adjust the number of Salesforce API calls allocated to HubSpot by entering a new number, then clicking Update. 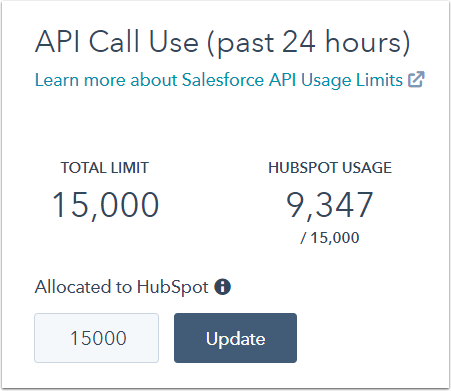 The API call limit for HubSpot should be set based on your Salesforce API call limit, as well as your current Salesforce API call usage. 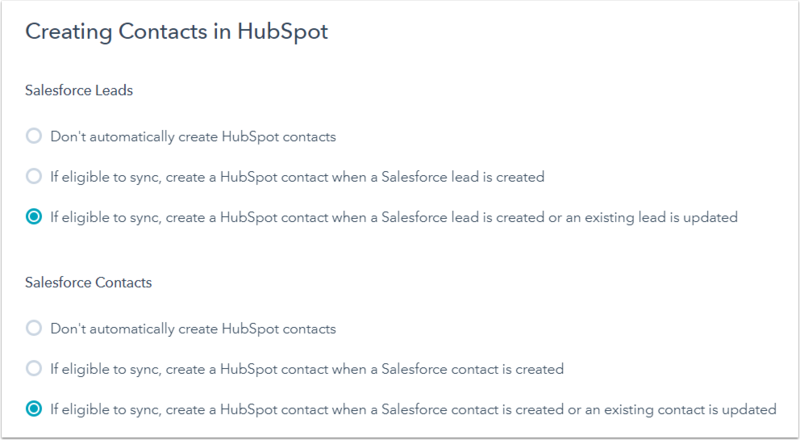 Contacts: HubSpot contacts will always sync with Salesforce lead and/or contact objects by default when the integration is enabled. To manage your contact field mappings, click Manage mappings externalLink. Companies: HubSpot companies sync with Salesforce accounts. To enable syncing between companies and accounts, select the checkbox in the Sync? column. Learn more about syncing Salesforce accounts to HubSpot. To manage your company field mappings, click Manage mappings externalLink. Deals: HubSpot deals sync with Salesforce opportunities. To enable syncing between deals and opportunities, select the checkbox in the Sync? column. Learn more about syncing Salesforce opportunities to HubSpot. To manage your deal field mappings, click Manage mappings externalLink. HubSpot engagements (e.g., form submissions, email interactions, meetings, etc.) can be synced to Salesforce tasks. Learn how to sync activities and tasks between HubSpot and Salesforce. There are two required settings to deduplicate HubSpot contacts and existing Salesforce leads/contacts with the same email address, and Salesforce leads/contacts and existing HubSpot contacts with the same email address. These settings are selected by default and cannot be modified. This setting allows you to choose whether new HubSpot contacts should create Salesforce leads or contacts. This setting allows you to select or create an inclusion list to limit the contacts that sync from HubSpot to Salesforce. Contacts that are not in your inclusion list will not sync from HubSpot to Salesforce. Learn more about creating a Salesforce inclusion list. Don't automatically create HubSpot contacts: new or existing Salesforce leads/contacts that are updated will not automatically create HubSpot contacts. 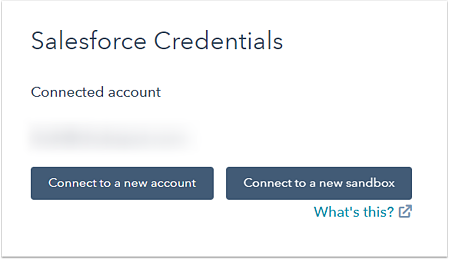 If eligible to sync, create a contact when a Salesforce lead/contact is created: new Salesforce leads/contacts created with a unique and valid email address will create HubSpot contacts. If eligible to sync, create a contact when a Salesforce lead/contact is created or an existing lead/contact is updated: new Salesforce leads/contacts created with a unique and valid email address or existing Salesforce leads/contacts with a unique and valid email address that are updated will create HubSpot contacts. This setting allows you to choose which (if any) types of Salesforce record deletion will cause the corresponding HubSpot contact to be deleted. This setting allows you to choose if actions taken on an associated Salesforce record will impact the lifecycle stage of the corresponding HubSpot contact. If Yes is selected, a Salesforce contact associated with an open opportunity will update the lifecycle stage of the corresponding HubSpot contact to Opportunity. If the opportunity is marked as Closed Won in Salesforce, the lifecycle stage of the corresponding HubSpot contact will change from Opportunity to Customer. This setting will not move a HubSpot contact's lifecycle stage backwards. For example, if a HubSpot contact already has a lifecycle stage of Customer, they will not move back to Opportunity if their corresponding Salesforce contact is associated with an open opportunity. The lifecycle stage of a HubSpot contact will not impact any corresponding Salesforce records. For example, setting the lifecycle stage of a HubSpot contact to Customer will not convert the corresponding Salesforce lead to a contact. The Salesforce contact must be associated with the opportunity via contact roles. Custom relationship fields between Salesforce contacts and opportunities, as well as opportunities with no contact roles, will not trigger automatic lifecycle stage transitions. If the companies Lifecycle stage sync setting is enabled, any other HubSpot contacts that are associated with the same company will also have their lifecycle stage updated. This setting allows you to choose if default state and country values in HubSpot should be converted to pass validation for Salesforce's State and Country picklists. If you have enabled State and Country picklists in Salesforce, select Yes. By default, the State/Region and Country properties in HubSpot are single-line text field types. If you want to sync Salesforce State and Country picklists with these default properties, conflicts will frequently occur because non-standardized values can be entered in HubSpot, which will not be accepted by Salesforce. Learn how to sync Salesforce State and Country picklists with HubSpot State/Region and Country properties. Enabling this setting will change HubSpot's default dropdown select values (e.g., Massachusetts or United States) to Salesforce's picklist abbreviations (e.g., MA or US) when the two systems next sync. Any changes made to the HubSpot or Salesforce values thereafter will prevent contacts from syncing. If you have not enabled State and Country picklists in Salesforce, or have customized the default state and country values in either HubSpot or Salesforce, select No.